The child is feeling “how long” is the rod. He is arranging the rods from short to long. 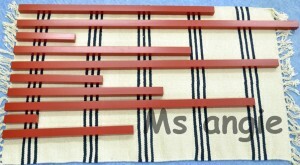 Introduce the concept of conservation of length. Visual discrimination of difference in dimensions (length). Prepare child for number rods and counting 1-10. 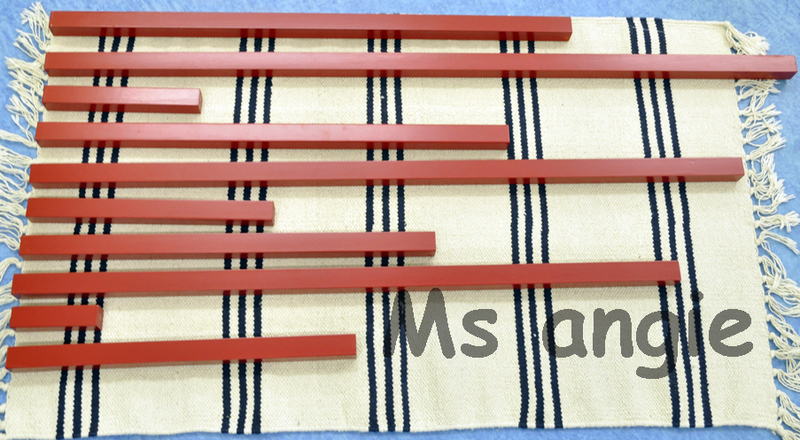 Mat, 10 red rods of varying lengths (length from 10cm to 100cm). The unit of difference between each rod is 10cm. These are the steps how we present to the child, remember before presentation you have to tell the child prepare working area. Bring him over to the Red Rod and tell him: “This is the Red Rod”. Show the child how to hold the red rod (Carry the rod vertical and so your hands are at waist level). 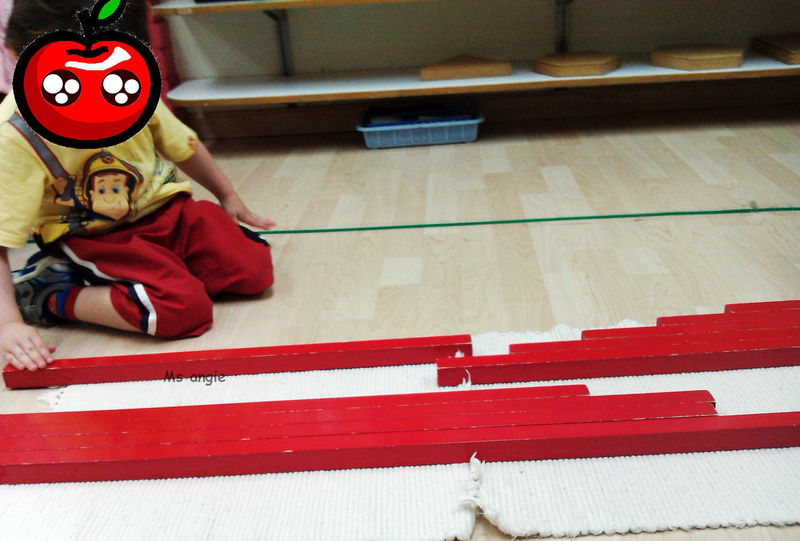 Let the child bring the longest and the shortest red rods. Have the child carry all of the rods over one at a time and place them horizontally in random order on the left of the mat. 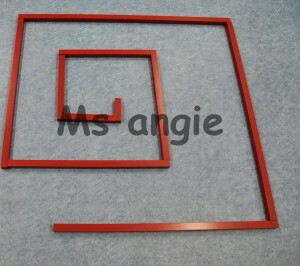 Place it in front of the teacher, run the right hand index and middle fingers from left to right slowly. Then bring the shortest rod at the lower left of the mat. Take the next shortest rod then repeat the steps 8 and 9 until the stair case is built. Dismantle the rods and put them randomly and invite the child to have his turn. Building a maze act as one of the variation. 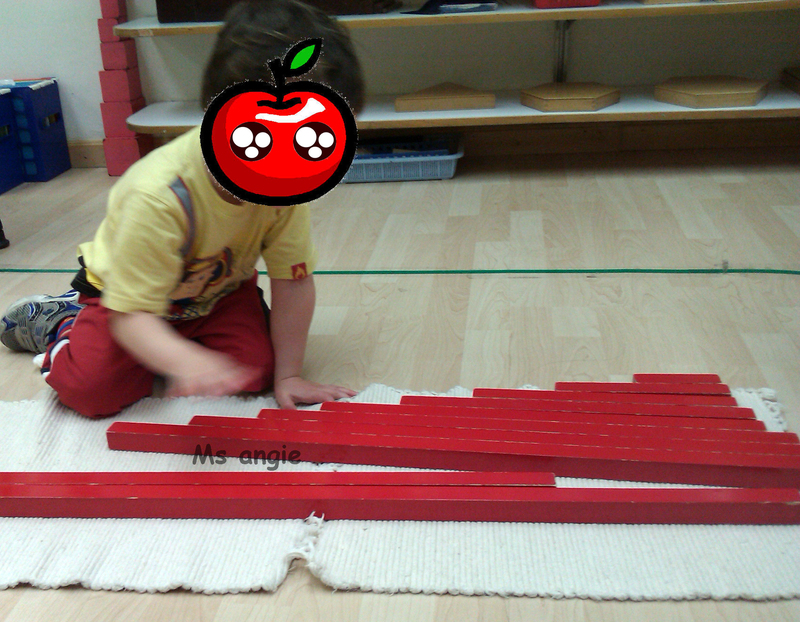 This entry was posted in 24 mths above activities 2歲以上活動, Montessori 蒙特梭利. Bookmark the permalink.